1 Framingham Human Relations Commission is scheduled to meet tonight at 7 in the Memorial Building. On the agenda is a discussion about the future of the Commission and the recommendation from new City of Framingham Mayor Yvonne Spicer. Spicer told Framingham Source last month she wants to re-name and re-focus on the Commission on social justice issues. 2. There is a forum tonight from 7 to 8 for Stapleton Elementary School parents about the principal search process. Yesterday, a 15-member Screening Committee was announced. It was big day yesterday for Framingham High athletics. The Flyers girls ice hockey, boys ice hockey, and wrestling all defeated the Tigers of Newton North. Framingham High girls ice hockey team defeated Newton North 6-1 for their fourth win of the season. The victory surpasses the wins in all of the 2016-17 season. Framingham High co-ed wrestling team was down 24-0, but pulled out a 35-33 win over Newton North to remain undefeated in the Bay State Conference. Framingham High boys ice hockey team shut out Tigers 3-0 for first win in 6 games. On the schedule today is an away meet for the Framingham High biys swim & dive team against Brookline High. The Flyers defeated Wellesley on the final relay event on Tuesday. Both the girls and boys basketball teams have game this afternoon. 4. 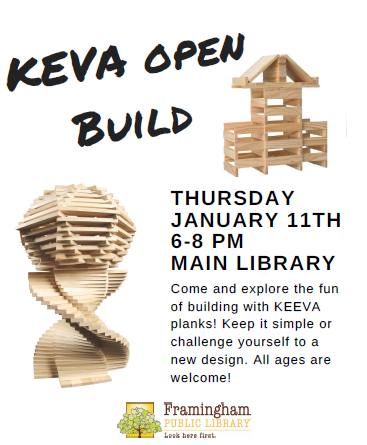 The Framingam Public Library is hosting a free 2-hour Keva open building from 6 to 8 at the main library. All are welcome. 5. Framingham Planning Board is scheduled to meet tonight at 7 in the Memorial Building. It is the third meeting this week.